Chic on a Shoestring Decorating: Flaunt it Friday 163! Did you see my "Bigger" Boy Room Reveal?!? I'm so excited about it, I hope you'll take a look if you haven't already. Lots of DIY and bargains plus chevron, gray and yellow... take a look! Are you ready to party?? I am!!! I love the headboard!! The room came together very nice! Thanks for hosting!! Hi Kate! Thanks for hosting each week! I really appreciate it! Have a lovely weekend! Thanks for the awesome party, Kate! Have a fabulous weekend! Gorgeous colour and pattern synthesis here for a young man's room and just enough bright yellow to wake up with a smile each day! 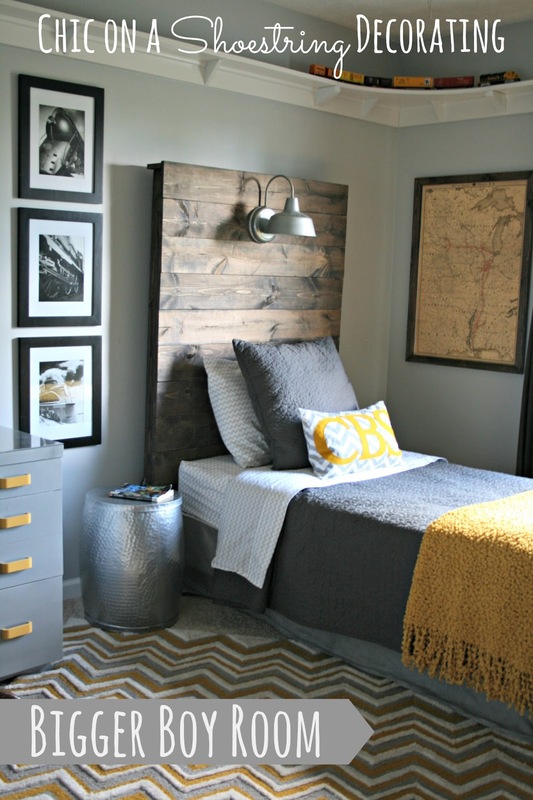 The headboard is very creative and the perfect finishing touch! Thank you for hosting the party, Kate! Have a great weekend! That bedroom is GORGEOUS!!! Loving the headboard too. So...rustic! This is my first time join in the party. Thank you so much. I linked back your party on my post. Hope to see you again next week. Hi Kate, Love the room! The colors are awesome! Love the headboard,very nice! Thanks for hosting. Hope you like my toybox!Have a great weekend! Glad I could make it to your party this week! Thanks for the invite! Hope you have a great weekend.